I have to admit that I haven’t visited many cathedrals: Dunkeld was a recent addition, but after a bit of memory searching I only came up with four others: Winchester, Hereford, St Paul’s in London and York Minster, all long before I had a camera or imagined setting up The Hazel Tree! I guess the reason is that we tend to gravitate away from cities most of the time, towards the remoter parts of the country and the scattered remains of early fortresses, castles and chapels. Some places speak to your heart more than others. But early in January I found myself in Edinburgh, with a camera, in glorious sunshine; so I made the most of it, and headed up the Mound towards the city’s most famous street, the Royal Mile. Here, among the many historical attractions, I decided to take a peek inside St Giles’ Cathedral. When I entered through the main west door, I must admit that I knew absolutely nothing about the place; my eyes were immediately drawn upwards, towards the magnificent ceiling and the beautiful windows. There’s something about high-roofed churches – I always get a sense of something suspended between earth and heaven, like the echoes of centuries-old prayers. The atmosphere was deep, cool and serene; sunbeams from the stained glass pierced the inky blackness of the shadows, casting kaleidoscopes of jewel-like brilliance onto stone pillars and archways. The website of St Giles’ Cathedral tells us that a parish church had been established in Edinburgh by 854 AD; later, in the early 1100s, a church dedicated to St Giles was founded by the sons of King Malcolm and Queen Margaret, with the aim of spreading the Catholic faith throughout Scotland. St Giles was born in Athens, and it is thought he came from a noble family. He gave away his wealth to the poor, and eventually settled in rural France where he lived a simple life of solitude. One day, a hind ran to him for protection from huntsmen who were pursuing it; some stories say that St Giles was wounded by accident, but he refused offers of compensation. He became the patron saint of cripples and lepers, and his popularity spread across France and England to Scotland during the time of the Crusades. The original church of St Giles was quite small, with rounded arches and elaborate carving in the Romanesque style, but there are few surviving traces of it in the building that we see today. Next came a larger church, which was set ablaze in 1385 by forces loyal to Richard II of England. It is possible that the four massive central pillars are the only remnants of this period. Over the next few generations, several chapels and aisles were added to the church, and in 1500 the impressive central crown-shaped spire was built. But flames of a different kind were soon to sweep through Scotland, in the shape of the Protestant Reformation; Mary of Guise, at that time Regent of Scotland, allowed the controversial minister John Knox to preach at St Giles in 1559, and afterwards the building was converted for Protestant worship. Knox served as Minister at St Giles until 1572, and when Mary’s daughter, Mary Queen of Scots, returned from France to take up her throne in Scotland, he admonished her on several occasions for her Catholic faith. The announcements of Mary’s second and third marriages were made here, and an accusation linking her third husband, the Earl of Bothwell, with the murder of her second, Lord Darnley, was nailed to the church door. During these troubled years, some parts of the church were used for unusual purposes, including a store for the notorious ‘Maiden’ or guillotine, and a prison for ‘harlots and whores’. A statue of John Knox stands in the nave, and he is buried, according to his wishes, in an old graveyard close by. The church was elevated to cathedral status by Charles I, who introduced bishops to Scotland. This move wasn’t greeted with enthusiasm, and in 1638 a National Covenant declared the Church’s formal rejection of royal interference. A much-faded copy of this Covenant still survives, and is on display in St Giles. During the Civil War that followed, St Giles was the silent witness to many executions, including the Marquis of Montrose, who was a Royalist Covenanter, and his bitter rival, the Marquis of Argyll. Over the next few centuries St Giles fell into disrepair, and in 1829 the architect William Burn supervised its restoration. This was continued by William Chambers, Lord Provost of Edinburgh, in 1872. Some unusual things about St Giles…. The nave and the chancel are roughly the same length, so the ‘crossing’ – the part where the north-south and east-west arms of a church meet – lies in the centre rather than towards the eastern end. In recent years, this central point has become the focus of religious ceremonies. The term ‘cathedral’ cannot really be applied to St Giles, because after the Reformation the notion of bishops, dioceses and cathedrals was rejected by the Church of Scotland. It is more correctly known by its earlier name, which is the High Kirk of Edinburgh. In 1454 some relics of St Giles – an arm bone and a diamond finger ring – were given to the Church by a nobleman. Some sources say that the relics were sold to local goldsmiths during the Reformation. However, in 2002 workmen discovered an arm bone hidden in a loft area above the Holy Cross aisle, one of the oldest parts of the building. I can’t yet discover if this was proved to be authentic. St Giles is known for its beautiful stained glass windows. Some of the glazing dates from the late 1800s, and there are several stunning pieces by the 20th century artist Douglas Strachan. 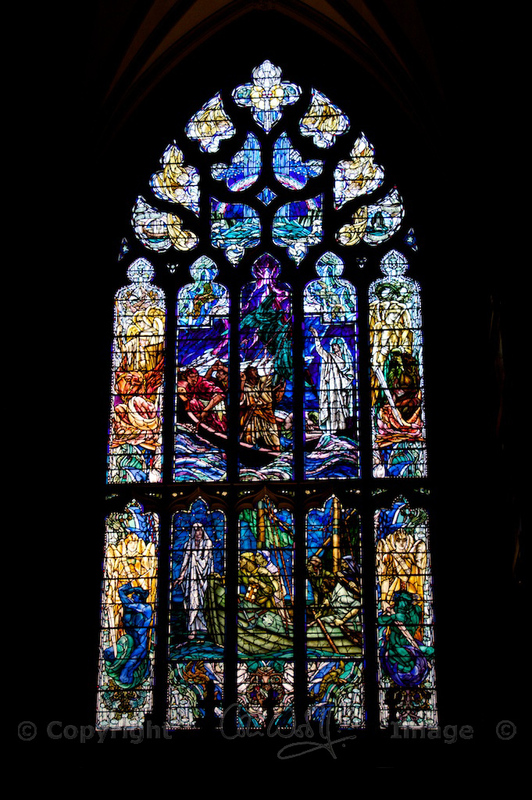 The north window, which depicts Christ calming a storm, stops you in your tracks and leaves you spellbound with its rich blues and purples. Over 200 memorials are housed within St Giles, in the honoured memory of distinguished Scotsmen and fallen soldiers. Among them is the writer Robert Louis Stevenson, whose bronze memorial is in the Moray Aisle. Between 1909 and 1911 the Thistle Chapel was added at the south-east corner. Designed by Sir Robert Lorimer, this tiny chapel measures only 37 feet by 18. It is richly decorated in neo-Gothic style to commemorate the holders of the Most Ancient and Most Noble Order of the Thistle, Scotland’s foremost Order of Chivalry which was introduced by James VII in 1687. The west window, by Icelandic artist Leifur Breidfjörd, celebrating the poetry of Robert Burns. And that’s a tierceron-vaulted ceiling. I didn’t know that, either! What did I love most about St Giles? The brilliantly coloured banners and heraldic flags, the soaring arches, the welcoming friendliness of the guides, and the sense of peace within its walls. If I’m honest, I wasn’t all that taken with the darker alcoves, tiny chapels that house the tombs and effigies of great noblemen whose necks were on the wrong side of an axe at a crucial moment. I was, however, moved to see a couple of poems and prayers written on scraps of paper and placed on the tomb of the Marquis of Montrose, along with a sprig of heather. My photos really don’t do St Giles justice, especially the internal shots, as I am still learning about long-exposure photography. I do a good line in ‘dark, brooding and atmospheric’, but this doesn’t bring out the historical detail! I did, however, enjoy walking around the outside and trying to capture the magnificence of the crown-shaped spire. Admission to the Cathedral is free, but you’re invited to make donations; a permit for photography is £2. Opening times and hours of worship are shown on the Cathedral’s website. There’s also a shop inside the Cathedral, selling guide books and souvenirs. If you enjoyed this, please take a look at my feature on Dunkeld Cathedral, which has history seeping out of every Gothic arch and stories lurking in every shadow. I always have enjoyed your trips and adventures, and admired the history and architecture of the ancients, but this place seems different somehow. It seems to have an almost Holy atmosphere among the beauty of the windows and architecture. Did it feel any different to you, for being a city cathedral rather than one of the remnants and ruins you’ve visited that were out among the hills? Those always seemed peaceful to me, with the city ones having a more austere but grand feeling, but this one seems holy and peaceful. Yes, it did feel different, but it’s hard to pinpoint in words! There was still a peaceful atmosphere, very welcoming, but it was less intimate and personal than, say, Kilmory Chapel. The feeling you get at Kilmory is more to do with the character of the people who lived and are buried there, and what their lives were like. This is the only way I can explain it: at Kilmory the sense of reverence is deep in the earth, whereas at St Giles it’s all around you, in the air. I hope that makes sense! 🙂 Thank you very much for this comment and question – really glad you enjoyed it! In awe at the magnificence of the vitraux, the entrance, the crown spires and the history of this place. I went over to the architecture website, very interesting in the details. Superb pictures and story, Jo!. Thank you, Carmen! It really is a magnificent place, with a history to match – inter-woven with Scotland’s own history. I would like to have seen the original church that stood there, and what the surroundings looked like. It isn’t the easiest place to photograph from any angle, and the inside was a challenge! Especially the Thistle Chapel – so small, so much detail, so dark! Thank you, I’m glad you enjoyed taking another look! I didn’t know that St Giles was the patron saint of cripples and lepers. As a student I often attended Sunday morning services in St Giles, I loved the atmosphere of the place and felt refreshed and at peace after being there. The organ is magnificent and they sometimes have recitals at lunchtime through the week, or you might be lucky and visit when someone’s practising. I think your photos conjure up a real sense of the interior. It is quite dark inside, but there are flashes of brilliant colour in the stained glass windows. Thank you, Lorna, I’m glad the photos give some sense of the interior. I should have tried a wider range of exposures to get some of the architectural detail, and especially the organ, which as you say is magnificent. I would love to hear it being played! With such a vast roof I’m sure the sound is amazing. I loved the windows and the banners – there are some very old banners in there, hanging in tatters, but they were in such a dark place, and so dark themselves, that it was impossible to photograph them. Aren’t they beautiful!? You couldn’t have asked for better lighting conditions! The intensity of the colours was amazing. I’ve sat and soaked up these pictures Jo – what an amazing place. I know I really have to make a visit because it combines two passions – historic places and stained glass – oh and what incredible glass it is, I think I’d need a long time to just sit and stare at that Strachan alone. The stained glass is certainly the best I’ve seen, Anny – and the setting and the lighting are just perfect to show it off. That Strachan is just mesmerising – so many shades and tones of blue/purple. I’m glad to know you enjoyed the pics! There is such a strong contrast of light and shade in there. Jo, this is truly an amazing piece of architecture. And you history lesson was quite interesting. I finally got to read it in it’s entirety today. YOu photos are perfect. My favorite is the second photo…the arches and ceiling are dizzying. 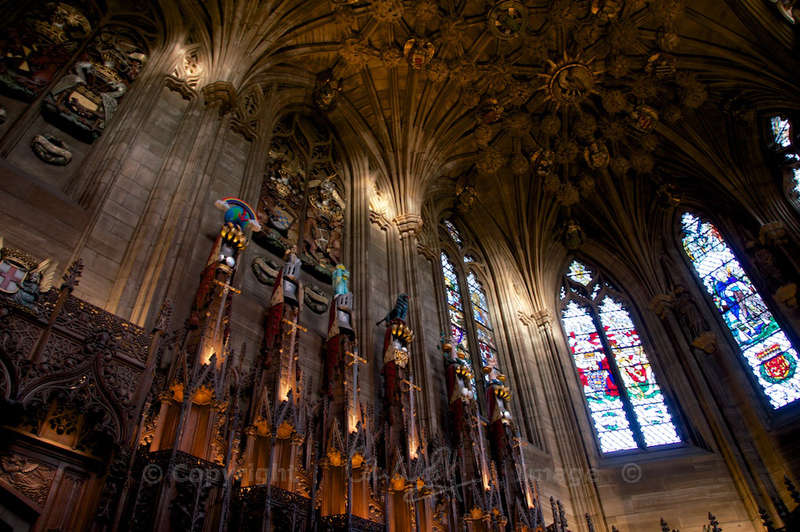 Love the shot of the spires also and the stained glass photos and . Ok that’s all of them. Well done kiddo!!! Yay, thank you! 🙂 That made me smile, and it’s a real compliment coming from such a good photographer! There are so many pics that I couldn’t rescue, as they were way too dark – a lesson for next time. But I’m glad that the ceilings came out OK, and the stained glass. You would have loved it! Jo Woolf from The Hazel Tree brings us St. Giles Cathedral in Edinburgh. This one has an important history. Thank you very much for this, Susan! You’re welcome Jo. I’ve actually been to this cathedral and love it. If there is one thing I enjoyed most about my visit to Gloucester Cathedral in 2010, it was seeing the stunningly colourful stained glass windows scattered around the church. There’s one so big that they have provided a mirror for you to look down on to view the window above you. You captured them so beautifully. And your lyrical description of your visit is lovely as always. Wow, that sounds amazing. I would love to visit more of England’s lovely cathedrals! I’m so glad you enjoyed this virtual tour – thank you very much! How can things be built so well that they stand for centuries? Quite beautiful. That’s very true, Dave. They certainly knew how to build, and where to build, in the old days!